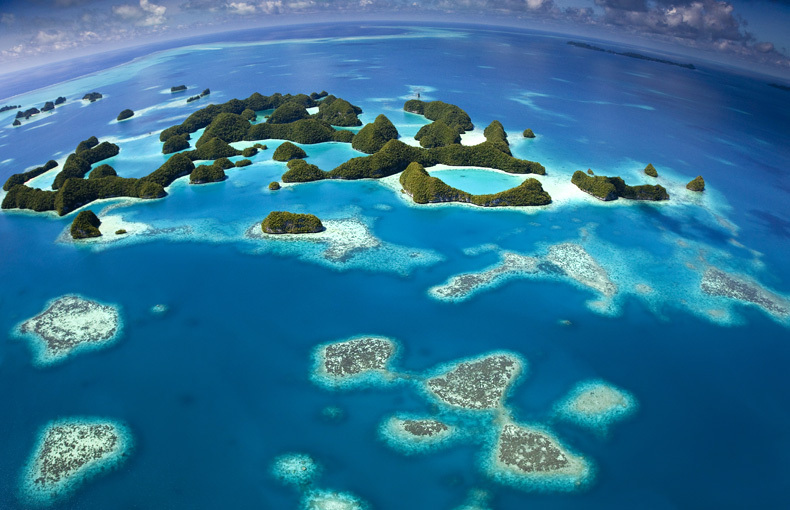 Micronesia covers 6.7 million square kilometers of Pacific Ocean, an area nearly equal to the continental United States. The region contains four percent of the world’s coral reefs and 480 species of coral—60 percent of all known species. It is also home to 650,000 people whose livelihoods and economies are highly dependent on functional reef systems. Yet these reefs are under threat from both local and global stressors, and insufficient resources and management capacity jeopardize their long-term well-being. 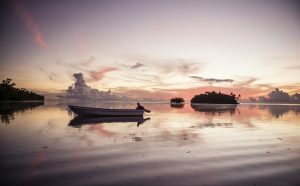 In 2006, leaders from the region stepped forward with the Micronesia Challenge, committing countries and jurisdictions to conserve at least 30 percent of near-shore marine resources and 20 percent of terrestrial resources by 2020. The Challenge includes the Federated States of Micronesia, the Republic of the Marshall Islands, the Republic of Palau, the U.S. Territory of Guam and the U.S. Commonwealth of the Northern Mariana Islands. More information on the Nature Conservancy’s work in Micronesia can be found at The Nature Conservancy in the Pacific Islands. 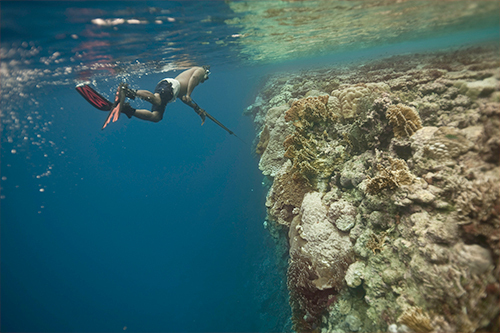 Mapping Ocean Wealth is building on existing knowledge of the region’s ecosystem services, with a particular focus on factors that affect the productivity of Micronesia’s coral-reef fisheries. 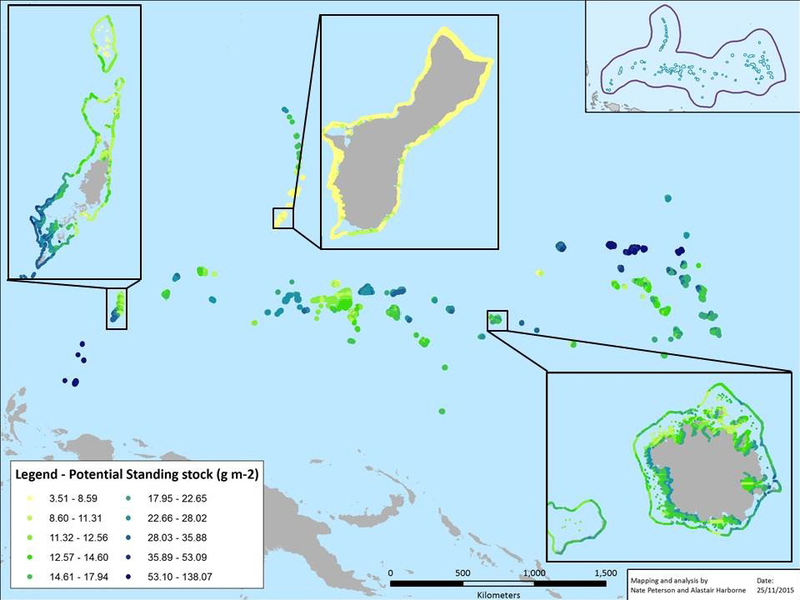 A study led by the University of Queensland, compiled fish survey data from over 1,100 locations across the extensive reefs and island chains of five jurisdictions in Micronesia in the Pacific Ocean. Almost any level of fishing leaves a clear signal: unfished reefs have a rich abundance of larger fish, such as parrotfishes, groupers, snappers and sharks. Such species remain where there is still some fishing, but the larger individuals are lost. As fishing pressure increases, the average fish size declines, and gradually some species disappear completely from the community. Using these ecological data alongside a host of other information on natural, social or economic variables, we built two models. One modelled cumulative fishing pressure using the average size of parrotfishes from the survey data. We assumed that more fishing would reduce average size. Parrotfish average size was closely linked both to human population density and to the distance to the nearest port. The second model examined the biomass of fish (or standing stock) currently present on the forereef slopes of Micronesia. This is strongly influenced by fishing pressure, of course, but many other factors played a part, including sea-surface temperature, oceanic productivity, upstream larval supply, depth and coral cover. From these models, we generated, for the first time, continuous high-resolution maps of fishing pressure and predicted standing stock for Micronesia. We can use the models to generate hypothetical scenarios to show what the reefs would look like if there was no fishing at all (potential standing stock). 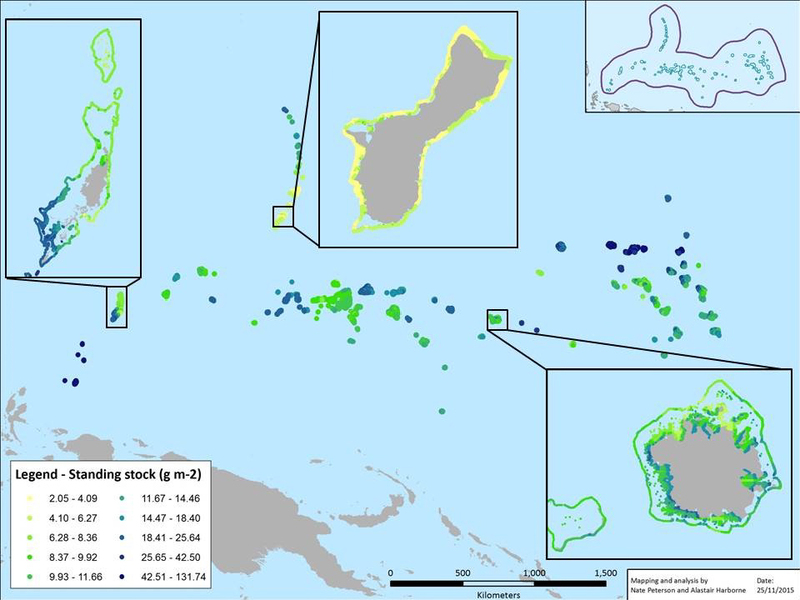 This map shows how, even in the absence of humans, standing stock varies considerably among reefs. We can also see how areas differ in their ability to cope with fishing pressure. For example, Guam has some of the highest fishing pressure, but also appears to naturally support fewer fish, making it highly vulnerable to overfishing. By contrast, some reefs around Palau also have high fishing pressure, but they still have high standing stock because they naturally have more fish and can withstand more fishing pressure. Comparing the differences between current and potential standing stock, we can also show the likely benefit of improved management. For example, some of the first species to be taken from reefs are the top predators, such as larger groupers, snappers and jacks. Our model is sufficiently robust for us to model their recovery, and in the more heavily fished areas around Guam and Pohnpei, we predict increases of 100-350 percent in standing stock of these species in the absence of fishing. Read the technical report here. 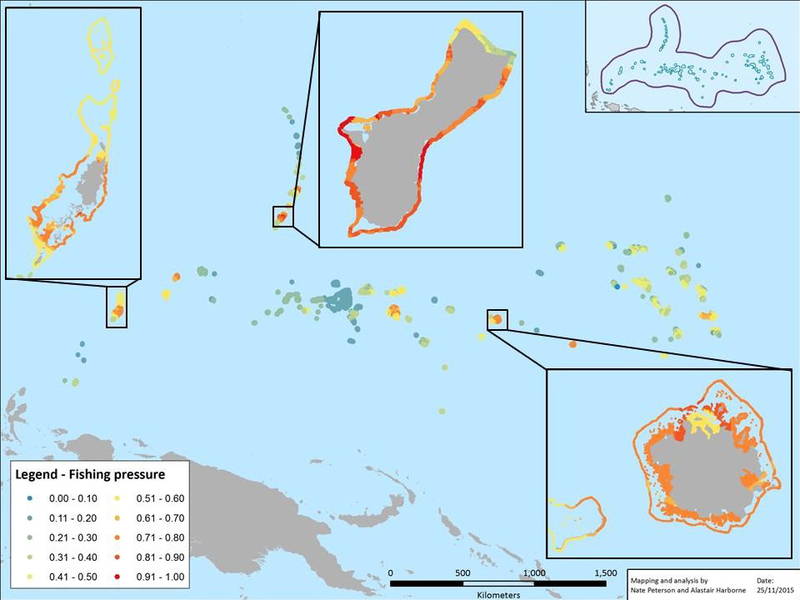 The strength and utility of these maps is considerable and field practitioners are already asking for specific outputs to support planning for improved fisheries management and Protected Area Network design in Micronesia. These same maps could also make a critical contribution to government commitments to undertake the Micronesia Challenge—a promise by all five jurisdictions to effectively conserve 30 percent of their marine resources by 2020. The results of this study were published in Diversity and Distributions in 2018. Click here to access the paper. Maps can be viewed interactively here. Fishing pressure: The model used ecological observations of parrotfish, a sensitive indicator of fishing, to show a tight link between fishing pressure, human population density, and proximity to ports. Current biomass (standing stock) of 19 focal fisheries species, which are representative of all fishery species. Potential gain in standing stock of six key predator species in the absence of fishing. Potential biomass of 19 focal fisheries species in the absence of fishing. Note that some areas, even without human impacts, would have naturally lower biomass than others. Mapping Ocean Wealth team members in Micronesia are planning on using the coral reef fisheries model as an input to the marine spatial planning process in Chuuk, located in the Federated States of Micronesia. While the coral reef fisheries dataset is informative at a regional scale, the team is planning on enhancing the data for improved accuracy and utility at finer scales. This involves correcting inaccuracies caused by data limitations, and adjusting the model so that it better predicts reef fish standing stock and recovery on lagoon reef habitats, rather than on reef slopes and fringing reefs, reflecting the predominant habitats in Chuuk. Similar to the regional MOW model, an output from this model will be a spatial map indicating where maximum ecological benefits are likely to accrue as a result of improved fisheries management. 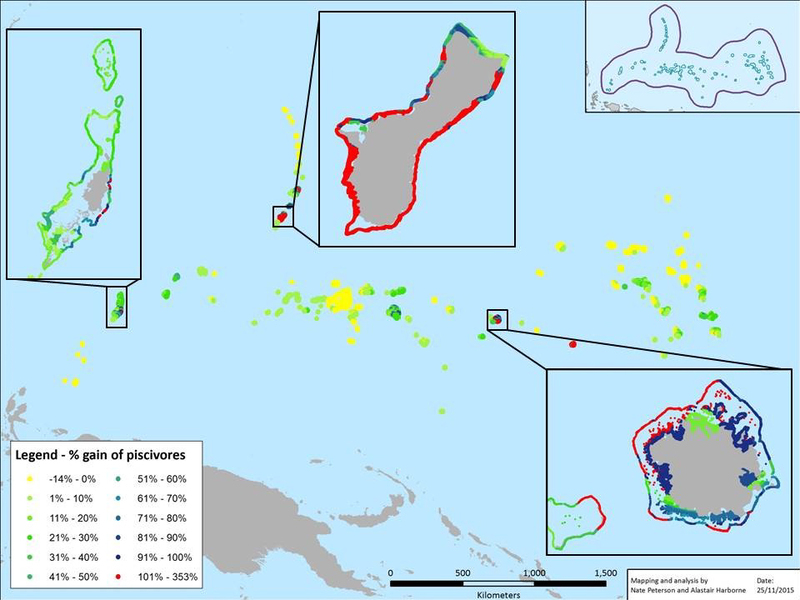 This information can be used in spatial prioritization exercises, for example, to design a protected area network that would achieve Micronesia Challenge targets whilst prioritising reefs that will produce the greatest benefits in terms of increasing reef fish biomass. Read more about the marine spatial planning efforts in Chuuk here.